Ready for the huge Golden Gate Park party? Radiohead, LCD Soundsystem, Lionel Richie are on the roster. THE ART OF MUSIC FESTIVAL ATTENDANCE... can be a bit of a high-wire act, of sorts, though an enjoyable one. You need to plan each step just so on the taut crossing, to make sure you reach your destination (or else face the net below). Likewise, planning is key at a mondo music extravaganza, one that spreads out over three doozy days and nights, with multiple acts performing. Have your tutu and tights on? And the harness around your waist? Then prepare to step out onto the wire -- or, in this case, gaze upon the the Outside Lands 2016 line-up, which was revealed on Tuesday, April 5. RADIOHEAD... leads the sonic charge at the top of the just-released bill, as does LCD Soundsystem. Lionel Richie will croon, too, perhaps visiting "All Night Long" and "Hello" for his legions of fans (fingers crossed). Lana del Rey will bring her languid-lovely balladry to the Golden Gate Park shindig, and Duran Duran will prove that the scene of a famous music festival is no "Ordinary World." Hoping Zedd will be on stage, too, at some point, and Grimes, and Sufjan Stevens, and Ryan Adams, and Beach House? Your hope is well-founded; all of these artists are on the plump-to-bursting roster. FRIDAY, AUG. 5 THROUGH SUNDAY, AUG. 7... are the big dates, dates that will require some pre-poring over before you and your pals decide who to see, and when, and so forth, and so on. But don't so forth/so on the food and drink scene, which is a major component of the eight-year-old San Francisco extravaganza; big-name chefs, and brewhouses, and wineries set up culinary camp, too. As do comedians and artists and a host of makers/performers/doers who sit outside the realm of music (though very much adjacent to its spirit). Are you ready to step onto the proverbial wire, with the goal of reaching the other side? 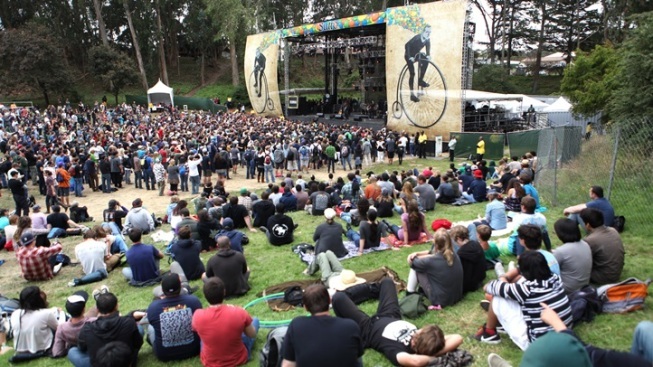 Planning your Outside Lands weekend is the important first part. Step out, gingerly, right here.